See the rest on Oregon Movies, A to Z…. 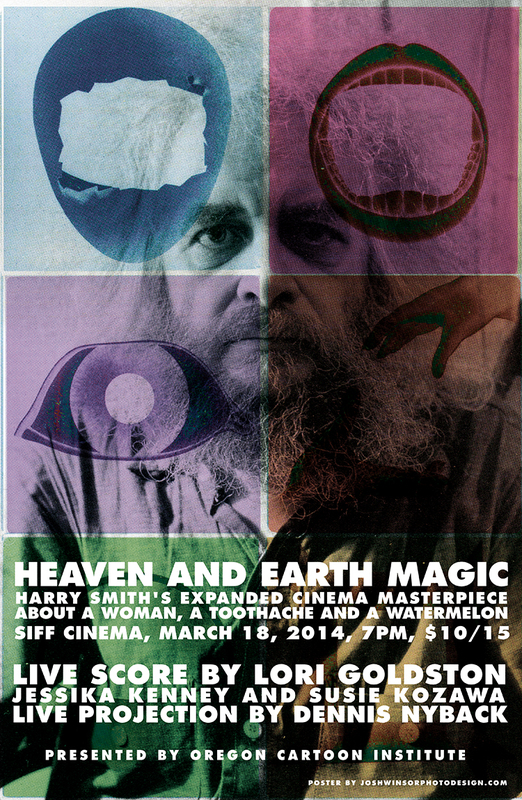 Oregon Cartoon Institute’s expanded cinema version of Heaven And Earth Magic comes to SIFF Cinema in Seattle on March 18, 2014. Dennis’ Pike Street Cinema comrade, Lori Goldston, will provide a live score, with help from Jessika Kenney and Susie Kosawa. Josh Winsor’s Harry Smith poster will be for sale at the event. You will be able to buy tickets for the event at SIFF Cinema online, but they haven’t gone on sale yet. Between Harry Smith (born in Portland) and James Blue (raised in Portland), I am up to my neck in mid-century Oregon genius. Later that week I take a paper on Harry to the Society of Cinema and Media Studies conference. If we can swing it, we hope to do a tour of Harry Smith’s Seattle, as we did in Bellingham.